Sambhal News: Shafiqur Rahman Barq M P Sambhal grandson Zia-ur-Rehman joined AMIM. 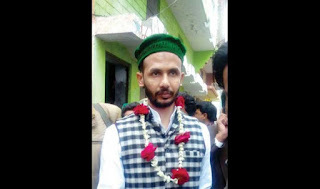 Sambhal's 'Young Turk' Ziaur Rahman Barq, grandson of local stalwart Shafiqur Rahman Barq who represented Sambhal for four terms each in Parliament and state assembly, is riding on popular support and may help Asaduddin Owaisi's All India Majlis-e Ittehadul Muslimeen (AIMIM) open its account in UP. In his twenties, Barq is a Turk Muslim, lakhs of whom live in the Rohilkhand region and constitute the largest chunk of Sambhal's sizeable Muslim population. Since AIMIM won two seats in Maharashtra assembly elections in 2014, Owaisi has been trying hard to launch his party nationally. In Bihar elections, AIMIM contested six seats and lost all. For the first time, the party is trying its luck in UP's 35 seats. However, based on the crowds that Owaisi's rallies here have drawn, observes say Sambhal is his strongest hope. The two factors helping Barq are his lineage and origin. According to historians, there are over 1.5 million descendants of Turks living in Rohilkhand and their large settlements are in around 900 villages of Amroha, Sambhal and Rampur. It is believed that Turks came to India during the Slave Dynasty. Its second king, Iltutmish (1211-1236), conquered Badaun and Aonla (Katehar) in Rohilkhand and Turks settled in the region in the time of Ghiyasuddin Balban (1266-86), who also served as deputy to Razia Sultan's brother Nasiruddin Mahmud (1246-66). Balban made Badaun an important center of his empire. Barq enjoys huge support among these Muslims of Turk origin. Significantly, of Sambhal's 3.51 voters, a staggering 2.5 lakh (more than 65%) are Muslims. Another factor in Barq's favour is his grandfather's immense goodwill in the region. The 86-year-old is considered the strongest leader here. Even in the 2014 Lok Sabha polls when a strong Modi wave had swept the nation, senior Barq lost to BJP's Satyapal Singh Saini by a mere 5,000 votes. Samajwadi Party's four-term sitting MLA Iqbal Mahmood, also a minister in UP government who is contesting against younger Barq, says the SP, and not Barq, is popular in the region. Ziaur Rahman disagrees. "SP is nowhere in this election and our main fight is with BJP," he says. BJP's Arvind Gupta, a local surgeon, enjoys popular support in the city and has emerged stronger due to fears of the division of Muslim votes in the Sambhal region. BSP's Rafatulla, another Turk Muslim, is bound to give some real fight to Barq in Sambhal which also has 42,000 scheduled caste voters.